HTP-Link provides automated bi-directional communication using regularly scheduled, unattended, overnight file transfer processing of multiple store locations. HTP-Link has many user defined advanced features such as data compression, data conversion, post processing and wild card file processing. It supports and manages remote communications over either a Wide Area Network (WAN) or via dial-up. 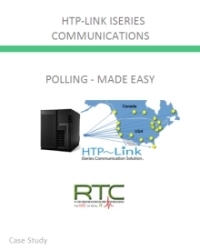 HTP-Link is menu-driven to simplify the process of entering and editing the necessary polling information. Regular file transfer activities are setup and scheduled one time to the user's specifications. All polling entries have the ability to run pre-polling and postpolling programs on the iSeries to allow continuous data processing, thus streamlining and reducing the nightly processing time window. Complete statistical history and diagnostic reports are available to the user to provide comprehensive management control and troubleshooting assistance. HTP-Link has features to prevent duplicate data transmissions and also has built-in error checking protocols. Missed files are automatically repolled both during the polling session and at the next scheduled polling event.